When you really stop to think about how utterly life-changing and disruptive to a fatal degree the apocalypse would be, the first thing that comes to mind is how utterly shock-inducing it would be. One minute, Western civilisation stands proud and strong, and with it, your small, comfortable sliver of the universe; the next, it is swept away by a tide so furious and alien to that which it vanquishes that coming to grips with it quickly or at all feels all but impossible. 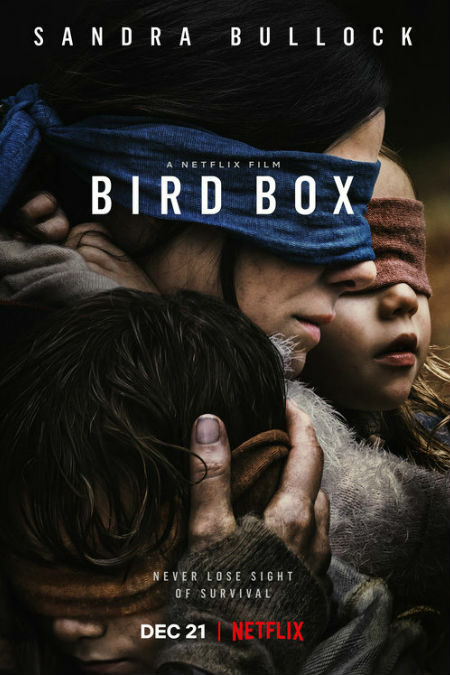 Bird Box, based on the 2014 novel of the same name by Josh Malerman, captures that feeling to a horrifyingly-visceral degree as the world is plunged into a nightmarish epoch in which one glimpse of an unseen monster – impressively we never see it and the film is all the better for that – causes you to commit suicide, driven mad almost instantaneously by a vision so fiendishly-compelled that death seems like the best and only reasonable option. The build-up to this ending of the reign of (sane) homo sapiens – there are those, the mentally ill chief among them, who are immune to the visions and regards the ghastly apparitions (again they’re never visible) as beautiful – is fast and furious with news filtering into the USA about strange goings-on in Europe just hours before the same virus of self-destruction infects North America. Malorie (Sandra Bullock), a near-hermit in her art studio, is single, pregnant and reluctantly at the hospital for an appointment with her obstetrician, when they witness a woman bloodily-bashing her head against a window. As anyone would be when they witness such an horrifically-senseless act, she and her sister Jessica (Sarah Paulson), who lives on a horse ranch our of town, flee the hospital, desperate to be anywhere but where the world is ending. But it soon becomes clear that such a place doesn’t exist, and after Jessica falls victim to the suicidal malaise racing in a toxic and frighteningly-fast wave across the city, and the world at large, Malorie finds sanctuary, at great cost, in a home full of strangers. Within an hour or so, her admittedly flawed but tolerably cosy existence, one shaped by a rough childhood that made her close to Jessica and no one else and fearful of being a mother, has been graphically rent asunder, as has everyone else’s, and the new family that forms in its wake in the home of irascible Douglas (John Malkovich) struggle to admit to the new world around them. Obviously food and supplies are an issue, all of which are addressed in one of the most harrowing scenes I’ve seen in a film where five brave volunteers including Malorie have to drive to a supermarket to get food in a blacked out car with a proximity alert that is unnervingly good at sensing when the creatures are around. What isn’t so easily addressed is the emotional fallout. Every single one of the inhabitants in Douglas’s blacked out home – for some reason the creatures don’t go inside any sort of structure and you are only at risk outside if you go outside un-blindfolded – are traumatised by the loss of loved ones and Bird Box evokes this sense of grievous, sudden loss powerfully and without flinching, helped by fine performances from Sandra Bullock, Trevante Rhodes as Tom and Danielle Macdonald as Olympia, who is also pregnant. What it also sense to an almost sickeningly-good degree is show how easily people are seduced to ending their own life. In one shockingly-intense scene, the safe idyll of the home, as safe as anyone can manage in this fraught new reality anyway, is completely ripped to shreds and the way in which this happens, can help but affect if you have any sort of beating pulse. So shocking is it in fact that you find yourself gasping and recoiling with horror, and this is after the film has kept the tension magnificently-sustained throughout its entire run to that point. 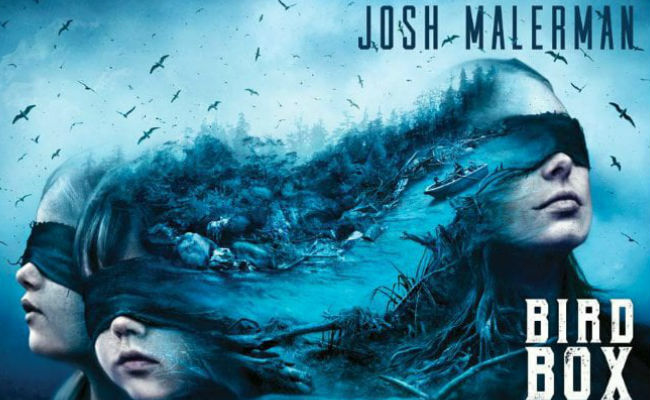 You might think yourself inured by that point to sudden shocks and emotional dislocation but Bird Box keeps ratcheting up the tension and emotional pressure, balancing the Malorie of five years earlier with her life now and the perilous trip down the river to safety which takes up the present-day narrative. While many of the characters in the house are reasonably and comfortingly trope-heavy, the film manages to use them effectively to set up an ongoing sense of people in real peril in a world which is now self-harmingly opposed to their very existence. At every turn, you witness real people, however one-note some may be, grappling with a reality far beyond anything they can comprehend and struggling to adapt. That they do is testament to humanity’s ability to withstand all kinds of storms given time, but there is no sense at any point that anyone is at ease with the new state of the world, and that tense balance between domesticity, again such as it is, and peril remains throughout the film. Bird Box succeeds because it remembers that the real star of the show is the fragility and tenacity of humanity. That’s why the monsters are never seen, their presence only suggested by manically-beeping proximity sensors and leaves swirling up into vortexes that moments before were calm oases and birds, which is why Malorie fights to keep three birds close by her at all times. The real story here is loneliness, the depths of the human condition and how we have a choice, if one remains to us – to be fair, the people affected by the visions lose all ability to make kind of cogent choice to fight back – to fight back and fight hard. In this respect, Sandra Bullock embodies perfect casting, vulnerably and affectingly living out the very fears that come from having to fight constantly through life for the world you want; when we first meet her she is resigned to a small “l” life but as the film goes on, is emboldened to fight for the kind of life she wants, and most importantly, that she wants for her children. 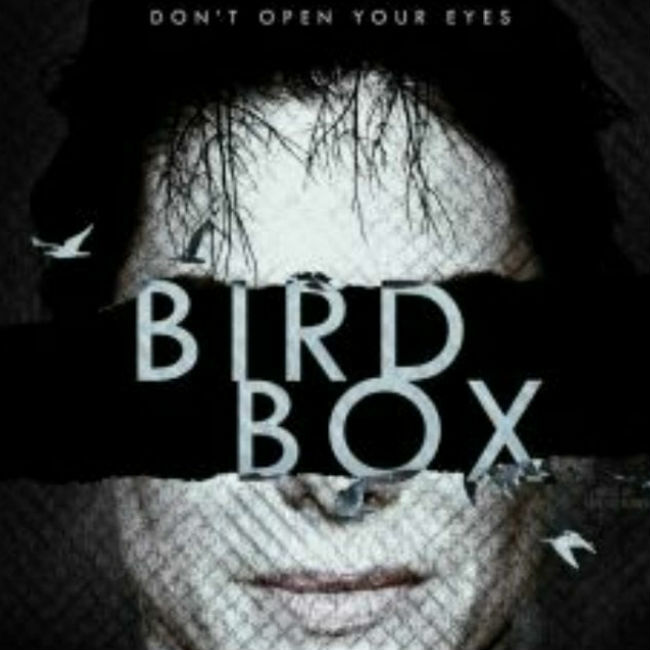 Bird Box is an epic fight for survival on all kinds of levels but it’s also an intimate portrayal of one person, assaulted by circumstances beyond her control again and again, and the way she responds to this terrifying new world when the greatest threatens don’t simply come from the monsters outside, but the one that lurks somewhere scarily within.